The Centre for Solar Energy (CSE) is a dedicated and specialized Centre, striving towards the advancement of the solar energy sector in India. It is involved in myriad functions such as techno-economic and resource assessment, preparation of solar roadmaps, incentive structures, model tariff, etc. The Centre is actively engaged in guiding both the corporate and government sectors through various stages of project development for different solar technologies, right from the conception stage upto post-installation certification. Proactive consultancy provided to various solar power projects has made the Centre a strong advisory force to reckon with. Prepare feasibility studies, detailed project reports, tender documents, and detailed financial modeling of solar power projects. Provide consultancy support as lender’s engineer, owner’s engineer, peer reviewer, and government consultant. Provide consultancy support for tendering procedure, bid evaluation and project monitoring at the time of implementation. Serve as consultant to investors, project developers, industrial houses, government and non-government agencies, as well as regulatory authorities, offering end-to-end solutions for solar project development. 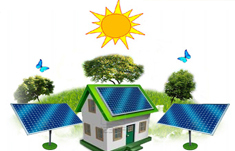 Assess the solar energy resources available in favourable regions across the country to obtain grid-connected and off-grid potential, and prepare solar roadmaps for different states in India.